Adults and children write to communicate ideas, to share information, and to record events. Playful Writing builds on the cyclical nature of learning with open-ended play ideas that will inspire children to write. 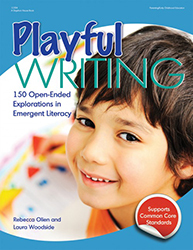 From the first marks of the youngest writers to ready writers who use their expanding vocabularies to express increasingly complex ideas, Authors Rebecca Olien and Laura Woodside offer teachers, caregivers, and parents of children ages three to eight, 150 ideas for inspiring and scaffolding children's writing explorations. Select the activities that best support specialized learning objectives as you help your young writers cultivate their creativity!